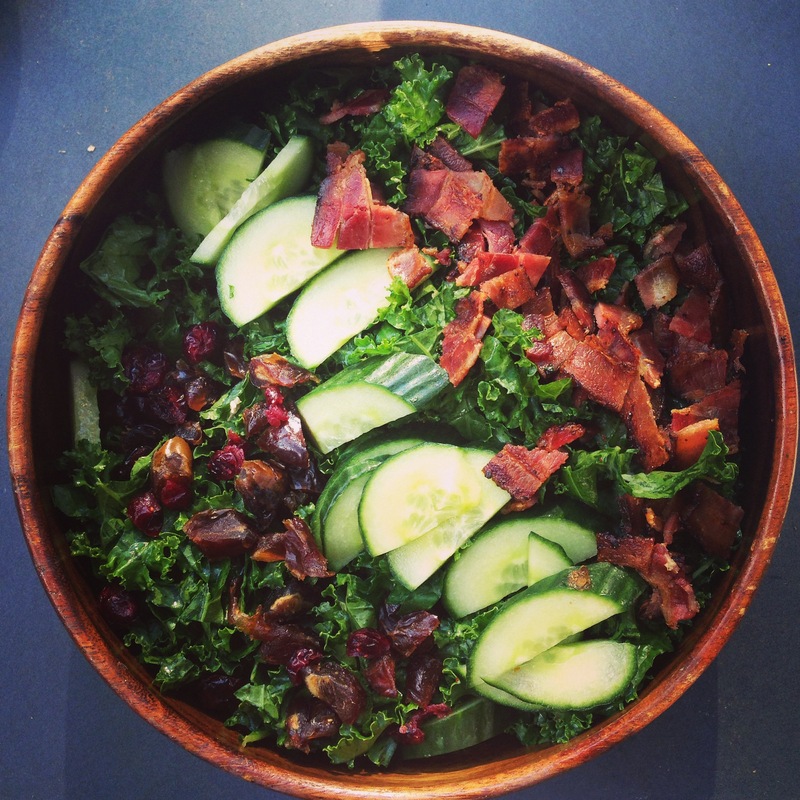 With a hankering for bacon and the idea to use kale as a vehicle, i was reminded of a warm bacon vinaigrette someone brought to a potluck dinner party i attended years ago. I didn’t have the recipe but googling brought me here, which i used as the basis for my dressing. This salad has countless add-ons and i have listed a few here. mine is reminiscent of those devils on horeseback- bacon wrapped dates stuffed with blue cheese (and sometimes almonds). Feel free to get creative. One thing that makes this salad so great– besides the obvious combination of bacon and dates–is that the warm of the dressing softens the kale just slightly. add ons: cucumber. dates or dried cranberries. gorgonzola. apples. some kind of nut or seed. if you want to be indulgent, a sunny side up egg. To make dressing: add bacon to cold frying pan. Cook on med-low heat until well done. move bacon to paper towel and reserve bacon fat. there should be about 3 tablespoons. you can add olive oil if you are shy of that. add shallot to bacon fat and saute a minute to soften. stir constantly. whisk in sugar, vinegar, and mustard. season with salt and pepper to taste. The key to a good kale salad is thinly shredding the kale. to do so, take kale off the stalk, pile the leaves, roll up and cut thinly (chiffonade). Add your desired toppings including chopped up bacon. add enough to warm bacon vinaigrette to lightly coat. enjoy.